Picking the right outfit for a speaking gig is a big deal. You want to dress in a way that reflects your personal style, but also fits in with your audience. 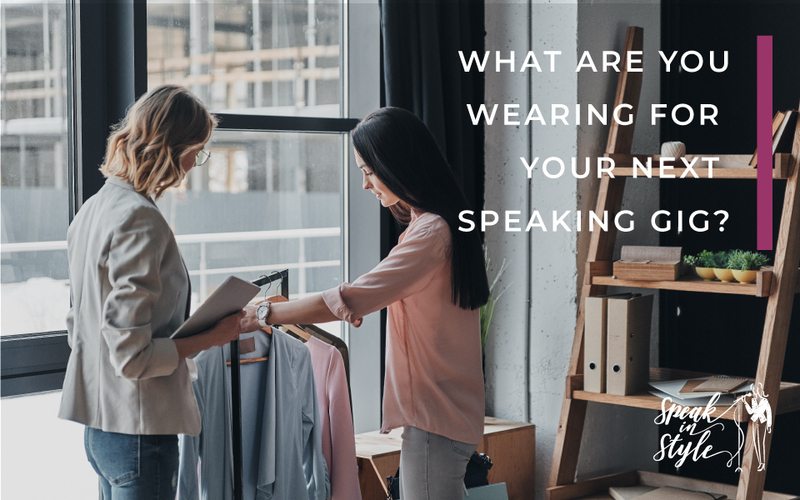 The truth is that for many female speakers, the process of deciding and sourcing the right outfit takes up unnecessary amounts of time and energy. 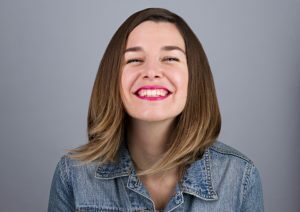 Wouldn’t it be nice if all you had to think about before a speaking gig was just that: your speaking gig? The good news is, there are some principles that can guide you in making your outfit choices. I’ve done a lot of speaking in my career, and I’ve figured out along the way how to adapt my personal style to suit my audience. How to adjust your style to suit your audience? Before you can adjust your style to your audience, you need to know your personal style. In my experience, this is a non-negotiable and is the basis for this article as it allows you to show up with authenticity and consistency. 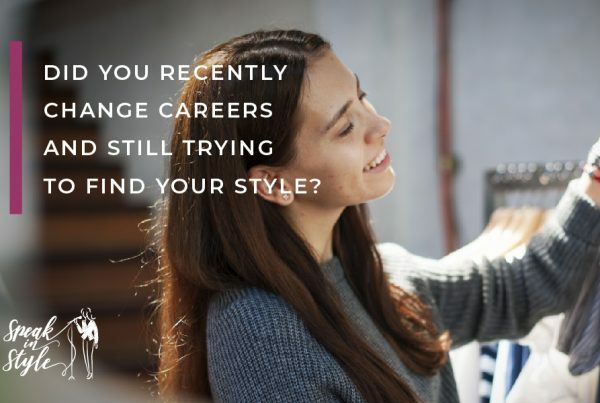 If this is still something you find tricky, have a look at this related blog post that can help you discover your personal style. The right speaking outfit will allow you to actively influence how you are perceived by your audience rather than leaving this to chance. Ask yourself: Who are the people in my next audience? What do I want them to conclude about me? What do I want them to say about me and my brand after I’ve left the room? Now think of three adjectives you’d want them to use to describe you. Defining those words every time you are booked to speak will allow you to dress with purpose for that particular audience. to record your three descriptive words! However you want to be seen by your audience, you can intentionally adjust your style while staying true to yourself! Big relief: there is no need to look like a stewardess, those days are over – even in the city. Still, the banker and lawyer scene can give us a threshold to know the current corporate style vibe, as even within this sub-culture we can find trends that will help us to avoid looking dated and stuffy. Taking the characters from “SUITS” as an example, why do the women wear predominantly single-colour dresses? They are using it to create the column of colour which creates height and gravitas, allowing them to stand their ground, to be taken more seriously and to radiate power and authority. As a bonus, the column of colour will make you look taller and slimmer. It’s important not to interrupt the vertical line from top to bottom, so even if dresses are not your thing, you can wear a jumpsuit or the same colour blazer and trousers / nice top and skirt to create the column effect (although I’d advise against wearing a jumpsuit if you are the MC!). Surprise surprise, guess why men’s fashion hasn’t let go of their suits yet? It’s the power package of style! 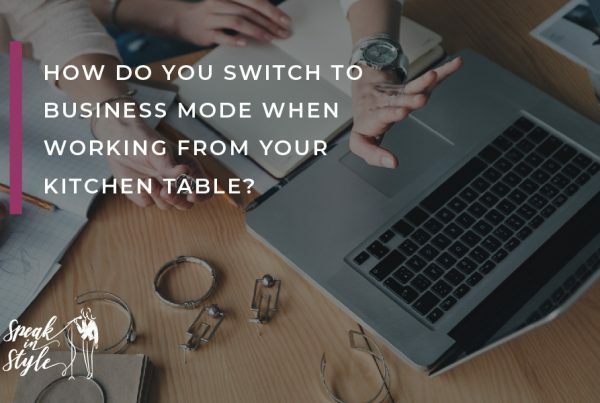 Let’s say you have decided that you want to be seen as the thought leader, but the audience and the venue are not actually formal enough for a full on modern corporate look? You can still use elements from the smart sphere and incorporate them into your outfit. Looking all dressed up and formal could feel unnatural, and might alienate your audience if your objective is to be perceived as approachable. Of course, you’d not want to go to the extreme of turning up for your speaking gig in yoga pants (unless that’s your brand). To create an easy going, casual and gentle look, use fabrics, cuts and colours that are associated with “weekend vibes”. Most likely, you’ll fall somewhere in between. So use your unique combination from the smart and from the casual elements above to position yourself exactly how you want your audience to see you while not feeling fake or as if you are wearing a costume! For example, a blazer made out of a corduroy fabric combines tailored professionalism with a gentle approach. Allow yourself to be guided by the three words you defined earlier that you want your audience to use to describe you. “Do I look approachable?” etc. Think of style as a long graph, or Style Scale, with lounge wear on one end (ultra casual) and a full blown stewardess uniform at the other end (ultra formal/smart/professional). 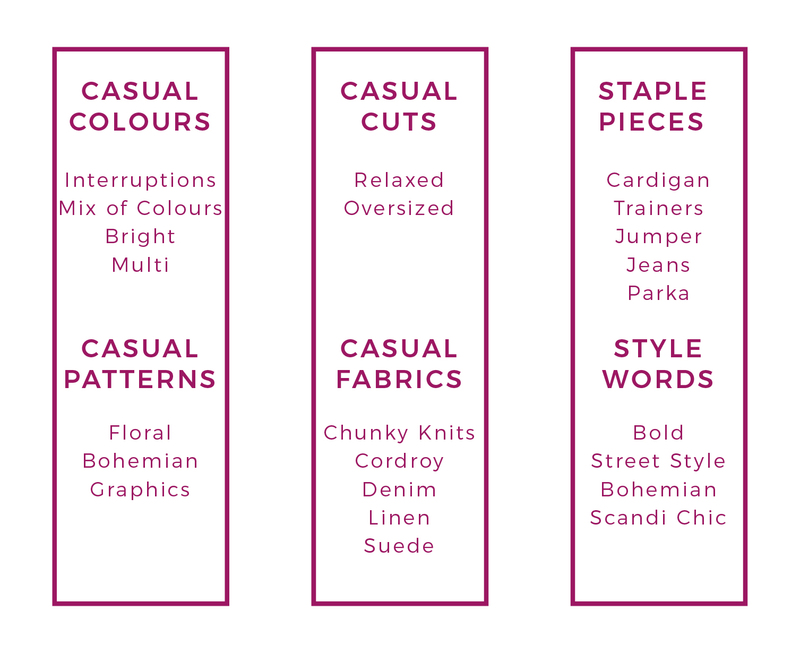 As you can see, there are a million and one ways to wear smart-casual which makes it so difficult to navigate. 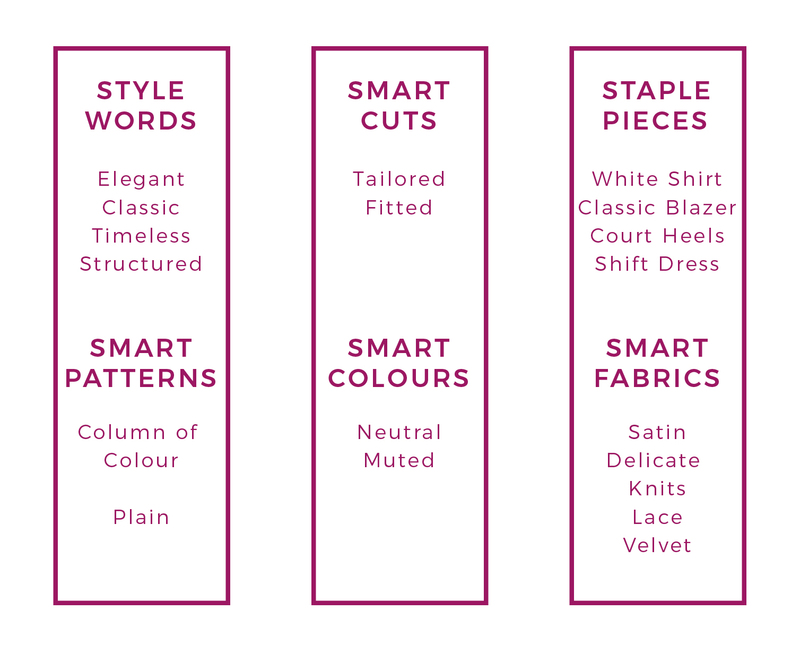 But now that we understand what colours, fabrics, cuts and patterns fall on which end of the smart-casual spectrum, it will be much easier to find our unique combination that conveys your style words. Here is a trick: think of your everyday style and position yourself on the style scale – that’s your starting point. If your everyday style is more on the formal side then you’d dial it down to appear more approachable. On the other hand, if you are naturally a more comfortable dresser, dial your outfit up a bit to look more professional. It really depends on your own unique position on the smart-casual style scale that will determine how much you adjust to your audience. A word of caution: The moment you adjust too much, you may lose your identity, feel less comfortable and won’t be perceived as authentic and trustworthy! It would be like wearing a mask or a costume, pretending to be someone you are not. 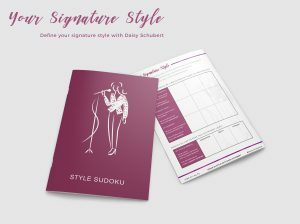 As you know from my blog “How to find your personal style”, my descriptive words are bold, structured and timeless. 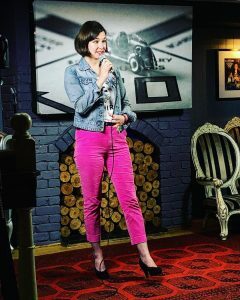 We saw how my pink trousers tick all those boxes for me. Now I’ll show you how I add tailoring or denim to move them along the style scale depending on my audience. 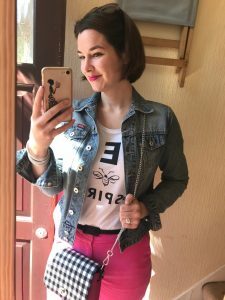 Notice how the bold choice of colour is both true to my style identity but also creates a playful, fun and light look for this casual outing to the Vintage Fair. I’ve kept my need for structure in the check pattern and the stiff collar of the shirt. 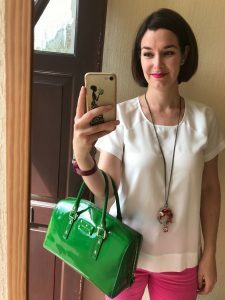 A Longchamp tote bag, silver jewellery and blow dried hair give a hint to my timeless side. Overall, the outfit is fun, bold and a little quirky, exactly what I wanted to express on that occasion. You know when you attend anetworking event and want to be seen as both professional and approachable? This was my outfit for the Janet Murray Meet Up in London. I decided to keep it really simple, with blocks of bold colours and overall minimal fuss. I’m all about simplifying my client’s wardrobes, so when I meet a new audience of potential clients I obviously want to walk the walk and not just talk the talk. I chose this top because it reminds me of a simple t-shirt but the shiny fabric elevates it to a smarter look – win win! I’ve added a long pendant necklace for balance and to create interest (it sometimes works as a conversation starter, too). Overall, my goal was to keep it simple and polished without looking corporate. Do you ever attend seminars or masterclasses specific to your profession? 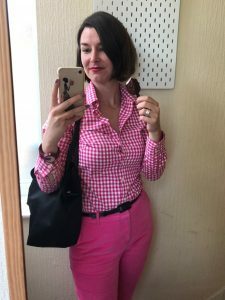 As a Personal Stylist, those meetings mean that I’m in a room full of colleagues and I feel the most pressure to look great although that’s really irrational – Stylists are not at all the judging type. I decided to go with a pink column of colour to create presence and authority among my colleagues. 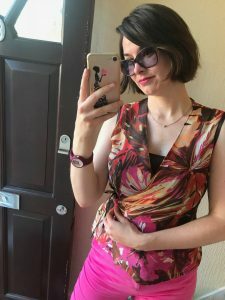 My mum made this silk blouse for me: I love how the flower pattern and mixed colours create a gentle feel, while the cut and fabric are more on the formal side. As I don’t need to prove anything to anyone here (these are not potential clients, but colleagues) I decided to break some of the rules and mix cool shades (pink) with warm shades (brown), just to be a bit rebellious. Professional Outfit for IRRV Leaving Dinner – Good Bye Day Job! 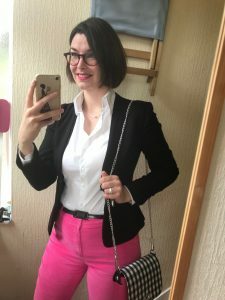 This is probably the most corporate I’d go, even when I used to work in an office in the city: A classic white shirt and a staple black blazer do the trick for me, sending all the smart signals to my audience while staying true to myself (aka pink trousers). Again, my personal style words shine through (timeless, bold, structured) just as they did in all the other outfits. I’ve simply added a bit more structure and timeless classics to the composition than I did in the other looks. You will be relieved to know that I have more than one pair of trousers. But as you can hopefully see from the examples above, adjusting your outfit to your audience doesn’t take much – sometimes it’s just a case of changing your top. 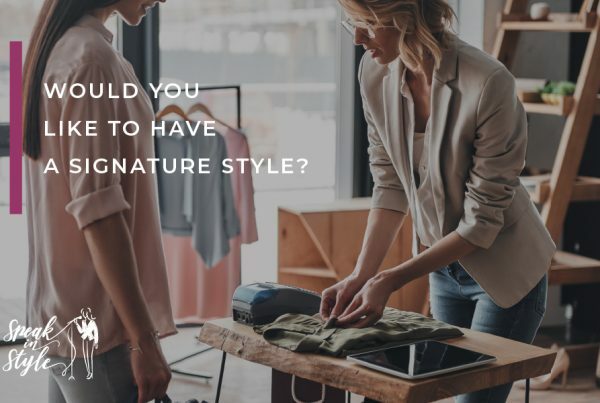 Remember to first decide on the impression you want to make on your audience and then adjust your personal style accordingly. 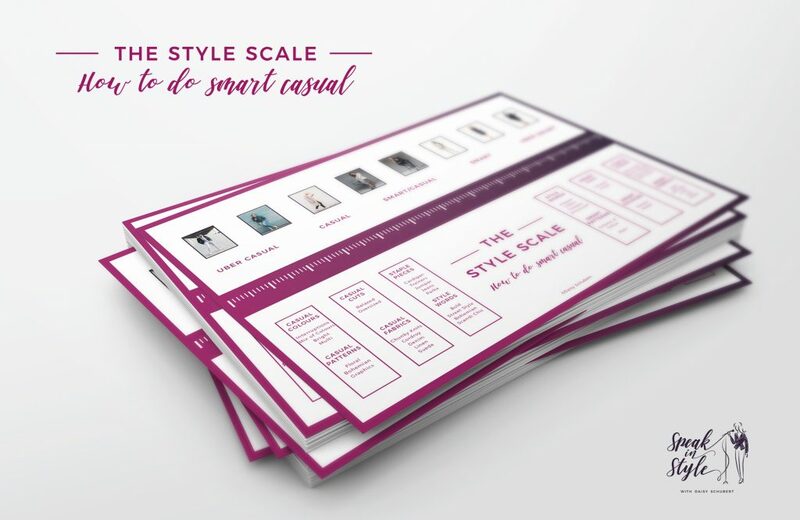 I hope the Style Scale will allow you to get dressed much more confidently for your next speaking gig. You can download the pdf here. 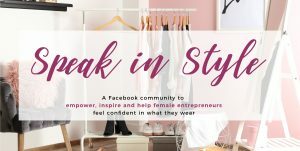 PS: Looking to connect with other female speakers in real life? Then the Female Speaker Conference on 11 October 2019 organised by Lovelda Vincenzi and Annik Petrou is for you! Next Post5 reasons why your LBD shouldn't be black!